For drawers. Surface mounted. Requires 7/8" diameter hole for cylinder. Key is removable in both the locked and unlocked positions. Comes with: 2 - keys and mounting screws. N8706 furnished with strike. 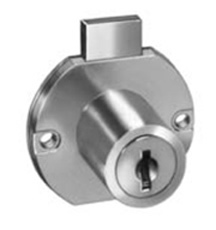 Horizontal mount deadbolt lock for drawers. Requires 16.5mm diameter hole. Comes with attractive tough nylon housing and a 3/8" throw. Mounts in 3/4" material.